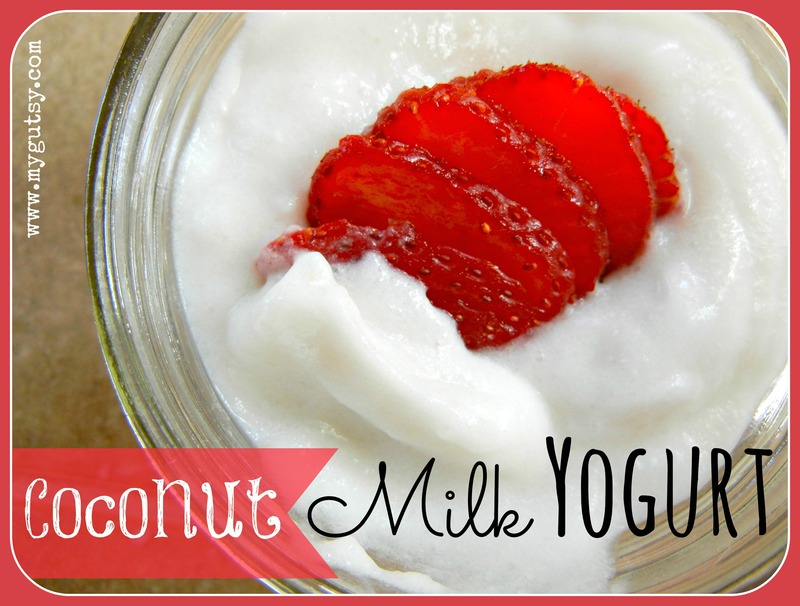 GAPS coconut milk yogurt is the answer to your dairy free yogurt dreams! Here is a recipe I know a lot of you have been waiting for. Thanks for being so patient! My big coconut milk yogurt flop! I tried all types of dairy free yogurt but they were all filled with wired gums and goos. I thought to myself..why not make my own?! Well the first few times it was a big flop. I didn’t know that coconut milk doesn’t thicken like regular yogurt, so mine turned out exactly like cultured liquid coconut milk. I tried putting it through a cheesecloth..and well I got like 1/2 cup worth. I then brought out the Unflavored Grass fed Gelatin , and voila, this recipe was born. *confession: I actually put too much gelatin in and I didn’t want to waste it so I used beaters to see if anything would happen…YEP it made the perfect yogurt! I hope you like it as much as my friends and family do 🙂 Your effort will be well worth it. YES! Coconut milk is one of natures best foods for your body! Think about the old days where you would find a coconut in a tree and it could be a whole meal. No wonder why there are so many different coconut products! lauric acid which is a fatty acid that is found in mom milk. It promotes brain development and healthy bone growth. It is a super anti viral, anti fungus, anti microbial. That means it can kill off the bad guys that make you sick or give you candida. Coconut milk helps to control you weight, because fat does not make you fat. It is filled with minerals so your skin, hair and even attitude should be better. Better yet coconut milk is great for the immune system and it easy on the gut. So if you are sick or on GAPS, coconut milk is a good choice. * I list using both coconut milks in this recipe because I find that the canned stuff is creamier, but more expensive. So I mixed the two. Feel free to just use one if you would like. 1 pureed young coconut meat (optional)- This doesn’t really change the texture much. I like to use the water for young coconut water kefir, so I always have left over meat. Adding the young coconut meat also helps feed the fermentation process. (Bacteria options): 1 packet of vegan yogurt starter, ½ cup premade coconut milk yogurt, open a few probitoic capsules or few scoops of this powder. 2. Heat the 4 cups of homemade and the 1 ½ cans of canned coconut milk together in a stainless steel pot on the stove. Heat to 180 degrees. Use a candy thermometer. 3. Take out 1 cup of the warm coconut milk, sprinkle the gelatin on the milk, and stir the gelatin until dissolved all the way. (This step is important so you don’t end up with gelatin clumps). 4. 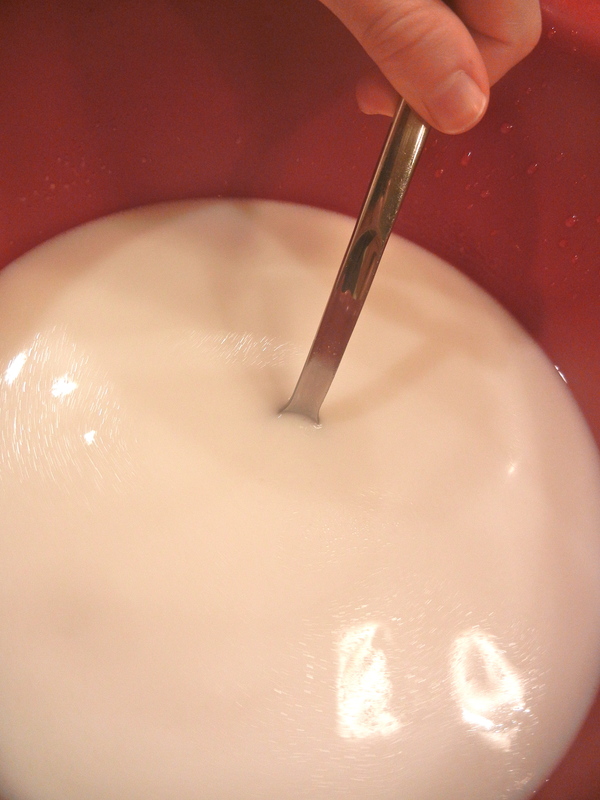 Add the 1 cup of dissolved gelatin/coconut milk back into the pot of warm coconut milk. 5. Add the sugar into the warm milk and stir until dissolved. 6. Let the milk cool down to 100 degrees. This takes a few hours, so I just left it on the stove to cool. Don’t put it in the fridge or ice bath because remember it has gelatin in it, and if you forget it, it will gelatinize. 7. (optional step) While the coconut milk is cooling, crack open a young coconut. Learn how here! 8. (optional step) Take 1 cup of the cooling coconut milk in the pot. (It doesn’t matter the temperature) and pour it into a blender. 9. (optional step) Spoon your reserved young coconut meat from step 7. into the blender as well. 10. (optional step) Blend away until smooth. It will be liquidly and easy to pour. 11. (optional step) Once the big pot of coconut milk is cooled down to 100 degrees, add the blended coconut meat minxture from step 10. 13. Sprinkle over your culture starter (or premade coconut milk yogurt) into the coconut milk. I like to pour my coconut milk out of the pot and into a bowl with a spout. 15. 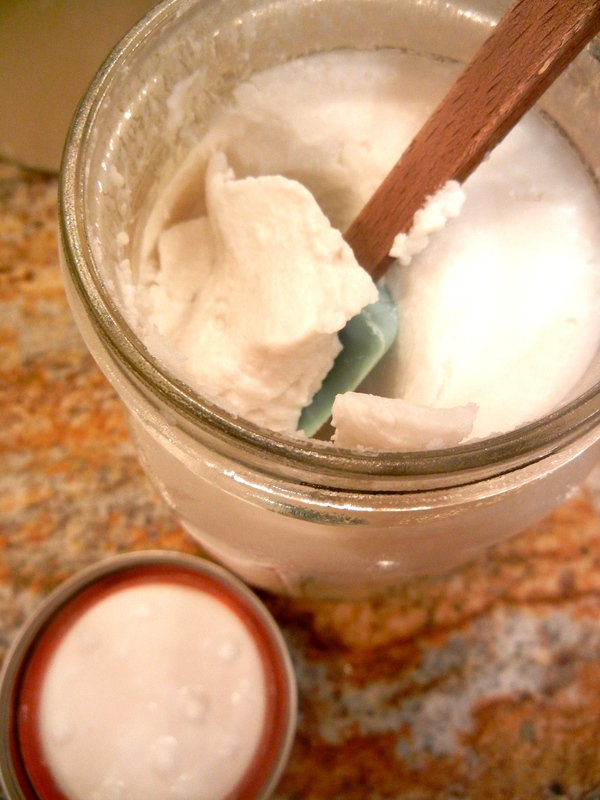 Pour coconut milk into 2 quart ball jars and screw on metal lids. 16. Keep at a constant 110 degrees for 7-10 hours to ferment it. I put mine in my Excalibur dehydrator. But an oven would work too. You need the heat so the bacteria grows. 17. Check and taste after 7 hours to see if the sugar has been eaten up. It should not be as sweet anymore. If you want it sour, keep it going a few more hours. 18. After it has been fermenting, you will see the liquid separated at the bottom. You will also see that it has not thickened. This is normal. 19. Refrigerate for 7-10 hours until firm. 20. Take out of the fridge. The coconut milk should be solid like Jello. This is good! 22. Spoon both coconut milk yogurts into a bowl. 23. Beat the jello consistency coconut milk, until it is smooth and has no more clumps. This takes a few minutes. It will go through stages. Jello cubes, chunky, and then creamy. 24. If yours creamy enough? If not keep beating..
24. 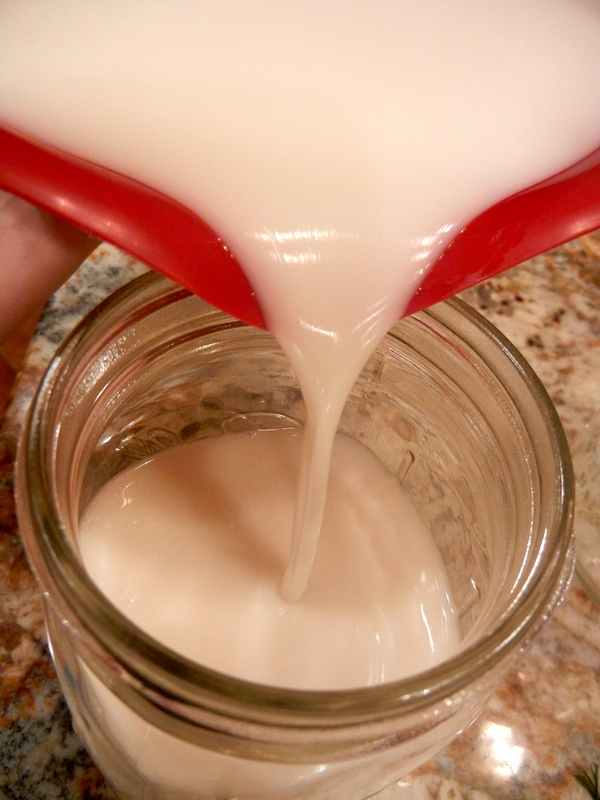 Transfer the fluffy smooth coconut milk yogurt (should be a pudding texture) into a bowl (to eat) or back into the jars (to save for later)–> I like to use these single serving jars. It will be a little thicker once it has been refrigerated again for a few hours! 25. Enjoy your yummy hard work! A great recipe, thank you, have shared it on my Facebook page..
Would it be possible to use apple pectin in place of the gelatin in this recipe? Thank you for this! I’ve tried it many times myself with less that ideal results. I’m definitely down to give it another shot! I can’t find anywhere on your page instructions for making homemade coconut milk. Or do you assume we all know how? So sorry! I linked it on the post, but here it is anyways. Thanks for catching that! What brand of canned coconut milk do you use? Thanks! Terri, I Use BPA free Native Forest. It does have gurgum in it though. I’m wondering if the canned coconut milk is necessary and if you have tried the recipe without this? I use the coconut cane milk because it is creamier, though maybe you could concentrate the homemade coconut milk more with adding more coconut flakes…I will try it this way. I bet it would work though! Where do you buy your grass-fed gelatin? I didn’t need both so i split it with my friend! This sounds so much better than the thin mess I made last time! Quick question about step 17. So it to be GAPS legal it’s still okay to ferment it for 7 hours as opposed to 24 hours? Did you already answer that and I missed it? Thanks! Yes it is, coconut milk ferments much faster then yogurt and it separates and becomes very watery after 24 hours..i tried and failed. Have you made this with only canned coconut milk (using the canned amount called for + subbing canned for the homemade amount)? I’m always looking for (& in need of) acceptable shortcuts. I’ve been looking for a recipe for this, thanks! I see the starter referenced here contains rice maltodextrin. Is this okay on a grain-free diet? yes, if you are not sensitive to rice or a wee but of starch, that is all it is. It helps get the starter going and it is eventually all eaten up in the process. Oh and is guar gum ok in the Canned milk?? Michelle GAPS does not really allow Guar gum but some people are ok with that tiny amount. There is a brand (Natural value) canned without guar gum. I don’t have a yogurt maker sorry! This might sound silly, but do you scoop ALL the contents out of the jars, or just the white stuff? So I could use all homemade milk for this recipe? If I don’t take the cream off the top it won’t be low fat which I think could be a concern for some people. Thank you for such a clear set of instructions! Doing GAPS with a casein (milk protein ) allergy means fermented dairy is completely out so I will definitely be trying this recipe instead! Anything made with coconut milk IS NOT a substitute for milk products. 1 cup of coconut milk has only 1 gm of protein. Yogurt should be a source of protein. this recipe is not. Thanks you for a great website the only question I have is that my yogurt separated like in your picture above but the bottom part was liquid not like jello any suggestions is this a problem? you probably did not add enough gelatin or did not put it in the fridge to cool it. Thanks for this recipe! I have tried my hand at coconut yogurt for a few years now and never had any that we could eat, clumpy, runny, and gross was all I ever got from my attempts. I have the dairy yogurt down and love it for me, but my Son with Autism hasn’t been tolerating it well. I want to still have him eat the beneficial bacteria with out the milk protein he can’t digest yet. Aww! Im so thankful your son can enjoy yogurt again! I am excited to try this recipe. I tried one before and used coconut manna and it had a texture to it so my son wouldn’t eat it. I ordered some coconut cream to make some more but do you have any idea how much water I need to add to it to make it work for this recipe? I usually make coconut milk with coconut flakes and water, i have a recipe on my blog. Or I use the can. I have not tried it with coconut manna or “coconut butter”… but I have made coconut butter and yes it does have texture. That is because it is not strained. Hi! Can I use refrigerated probiotic capsules opened up in place of the yogurt starter? If I did that, how many grams in weight is the starter? Thank you! I’m excited to try the recipe. Yes that is an excellent idea, because the starter does not actually help the coconut milk gel (the gelatin does that) I would use a few capsules (maybe 4) so each serving gets a dose. Could I use watered-down coconut butter somehow as a substitute for the milk? Thanks! I bet you could try it!